The year is 1327 and Brother William of Baskerville has arrived at an abbey in Italy where he is to attend to a meeting to try to settle the dispute between Franciscans and Dominicans. But when he and his novice, Adso, get there, they are asked by the abbot to solve a murder before the meeting is to take place. But then more murders take place and there’s a rumour among the monks that it is inspired by the seven trumpets of the Apocalypse. And William is certain that the answer is hiding somewhere in the library, but the library is like a labyrinth. 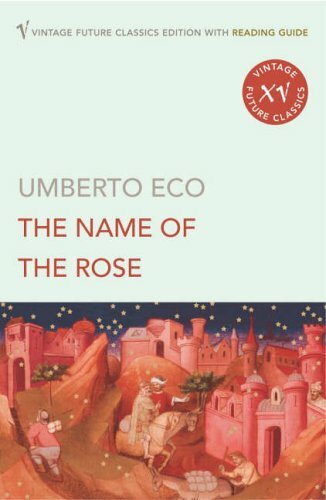 I hate that I always have the feeling that I have only understood less than half of the books Umberto Eco writes. But the story was at least easy to follow. But for me it was impossible to understand everything about the dispute between Franciscans and Dominicans and all about the heretics. I have a feeling that I would have benefited from knowing the papal history before reading this. And Latin as many Latin phrases are not translated. Some of them I understand out of the context and others I’m sure was some brilliant insults which would be nice to know. Nevertheless, Umberto Eco is a brilliant writer. And I’m in awe of the way that he has managed to construct an abbey and placed it in the 1300s. The characters are also interesting. And there’s a lot of interesting things that happens in the monastery, and especially at night.